Tuesday was a washout, but I was also busy doing bridesmaid duties for my friend’s wedding next weekend, so I did not spend much time playing pony. I did notice there is a bit of a power struggle between Poe and Simon. Both seem to make faces at the other and both seem to respect those faces. For now Linus is still hanging tight with Simon, but clearly defers to Poe as well. I suspect that eventually Poe will take over the lead role. Wednesday I was happy to see Simon and Poe being buddy buddy. Sadly this means poor Linus is being shunned, and has a few fresh bite marks on him. I was told that Simon and Poe were grooming each other throughout the day, swatting flies and getting along great like two best friends. So that’s a success. Linus and Simon both had a nice dirt coat on, but Poe was pretty clean, and just needed a light brushing off. I did rasp his front hooves down a little. Just rounding out the toe some to hold him over until the ferrier comes out. I plan to tackle his back hooves on Thursday. He stood politely and snuffled my hair when I was bent over. I have a bridle more sorted out for him with a simple snaffle baucher on it. This seemed to work, although I might need to pick up a smaller size, or at least add bit guards to square it up in his mouth a little. We started our ride off with a very brief lunge, and some basic w/t/c. 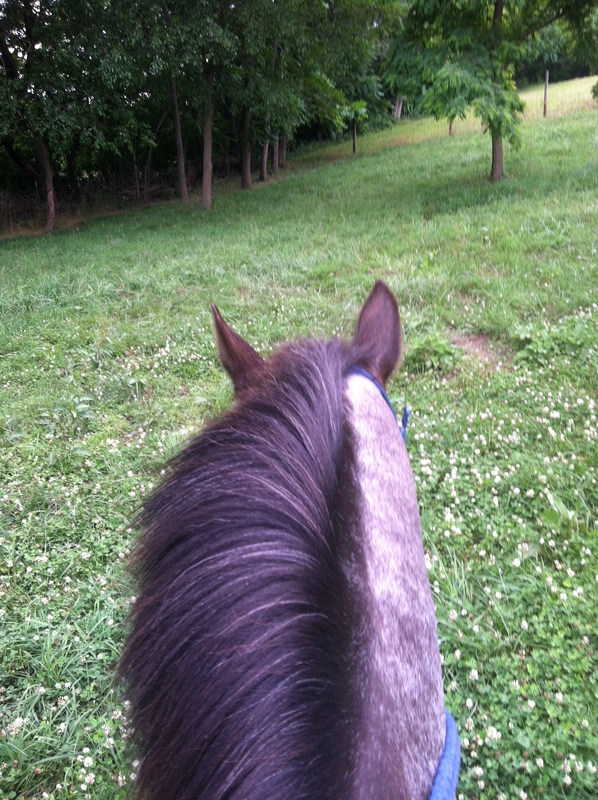 He does have an odd feeling canter, but it looks normal from the ground. Next we pushed into some games skills, starting with a few trots and canters through bending and then switching to mug shuffle. We played through a few rounds of 2 flag, and practiced some bottle picks and places. Next I introduced litter. I scooped one up on the end of the stick, walked around with it, and then dumped it back on the ground. Poe was cool with it. So I scooped it, rode around, rattling it a lot, and then dropped it a few more times at a walk and trot. Then we moved onto ball and cone. I pulled him up to place the ball and when I leaned over, he dropped his head to the grass. I yanked him up and he instantly popped his shoulder and turned to move towards the barn. I moved him back into line with a firm no, and we went back to work. Although it was no big deal for me, I can totally see how this behavior would have been too much for a small rider. Just very typical pony. 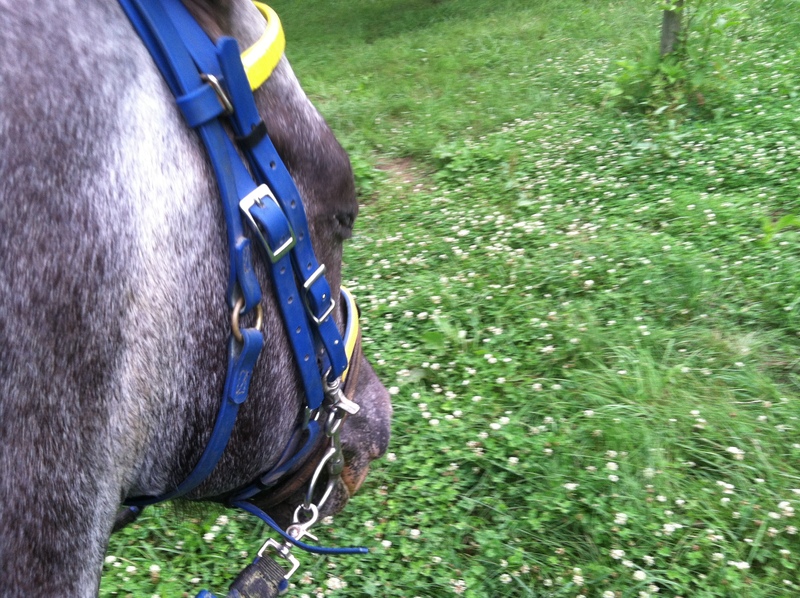 The big learning curve right now is neck reining. Which is very easy to put on over time and I am already working diligently on that throughout all our riding. The general point is to neck rein and direct rein at the same time. I am also using my leg pressure to reinforce this, and work on very sharp turns. Since he does not know the skills yet, and I am still a little unsure of him, and him of me, when I lean over for something, I lose a lot of my steering ability. And since he is still not sure what I am doing, he is unable ot auto correct his course on his own. But that is just fine. Right now I am sort of crash coursing him through the equipment, and trying to get a feel for him and give him a feel for games. 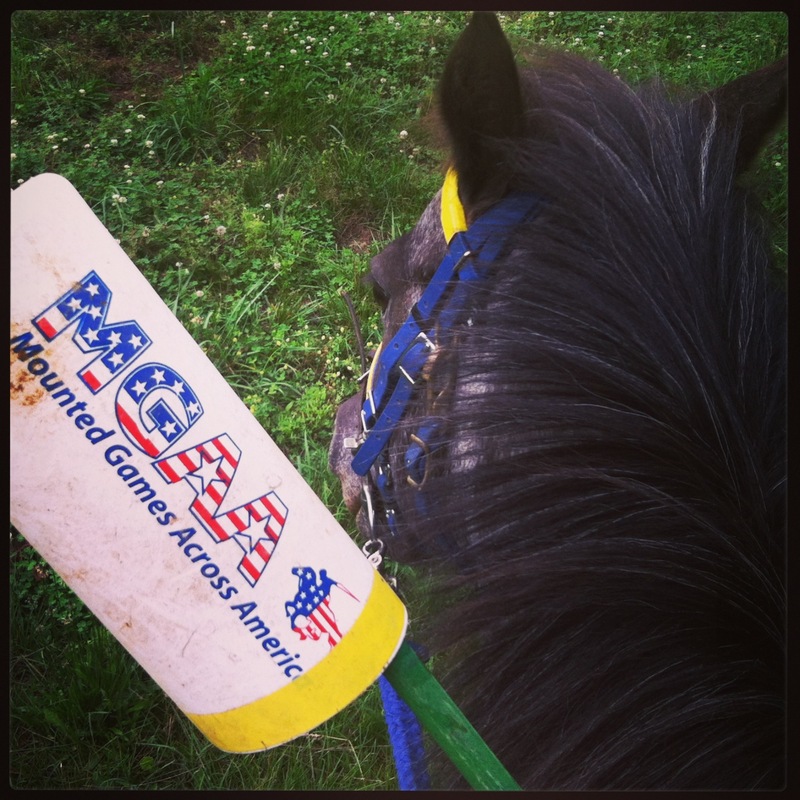 I am not so much running through races, as getting him used to the equipment, skills and techniques that are required of a games pony. So, standing while a rider leans over, or reaches, moving past things while a rider performs picks and pulls, loud clanging noises, and things flashing around behind his head, fun stuff like that. I will begin doing some flat work specifically focused on neck reining and tight turns soon. And I will also be piecing together the games and start really working on him learning them as well. 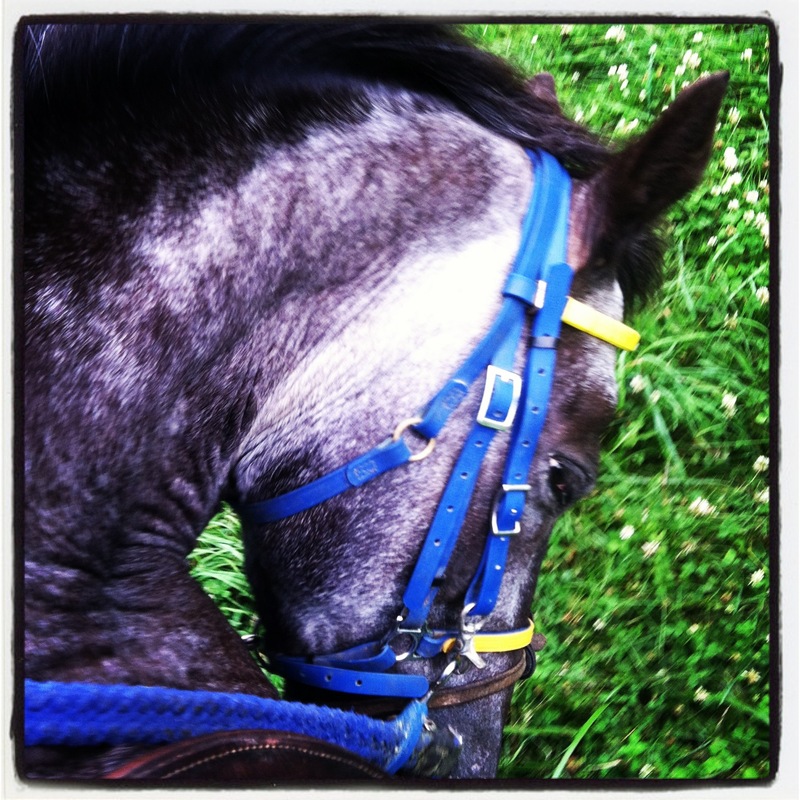 For now, I would like to have him ready to go out and ride at an easy w/t in the green division this coming Sunday. I am not usually able to make these small events that offer a training pony division, and there just happens to be one this Sunday that I can attend. For him, as with a lot of the green ponies, the goal of these events is just to get off the farm, to be around other ponies, and to get a feel for the set up and layout of ring operations. 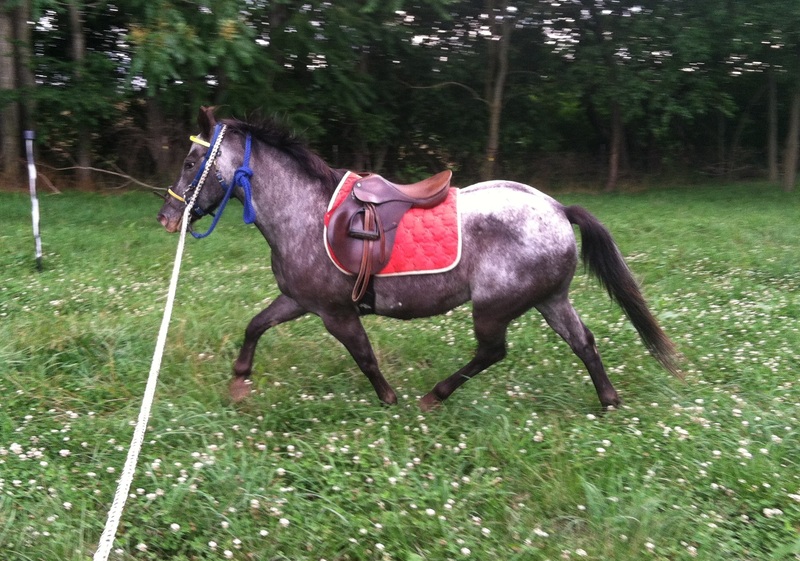 For him specifically, it will be other ponies moving back and forth past him, and hopefully learning about handoffs. He will also get to take part in race starts, and the general format of, up and back. I plan to keep it at mostly a walk/trot. There is no need to acknowledge the racing aspect at this time. We finished our ride Wednesday with a quick run back through each skill and then headed up for some cookies and a quick shower for Poe. I also noticed during feed time last night, that Poe has taken the lead. Simon seems happy with this, so all is good.